Spain - a country in Europe, the tourist business of which is one of the leading directions of the economy. There are a lot of reasons and prerequisites - a comfortable climate, excellent infrastructure, remarkable architectural monuments and scenic coastline. Due to such characteristics Spain is not only good for vacations, but also for a permanent residence. Of course, for this purpose, the most relevant are the resort areas of the country. Many foreigners prefer Benidorm on the Mediterranean coast of the country - the Costa Blanca. Real estate in Benidorm – an excellent investment in Spain. There are many opportunities not only for leisure and accommodation, but also for running your own business. In the middle of the last century Benidorm was a simple fishing village - then began its formation as a resort. The first vacationers appeared, and then, from the time of construction of an airport in Alicante, Benidorm began rapidly to grow and to be built up, acquiring new hotels, shops and residential complexes. 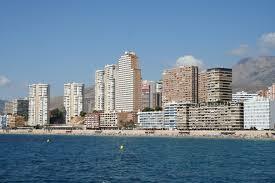 Now, the territory of Benidorm is rather densely built up with high-rise buildings. For this reason, detached houses and villas can be bought only in the suburbs, not in the territory of the resort. In the vicinity of the resort are located the most famous theme parks in Europe, which favorably distinguish it from the rest of prestigious resorts in Spain. Since 1956, the city embodied a special plan of vertical development, not very typical for Spanish town planning. Due to this, the main supply of housing in Benidorm – apartments, luxury flats and a small quantity of townhouses in the outskirts of the city. Detached houses with plots of land are currently being built in the suburbs of the resort. These are modern residential elite complexes. There is also a sense in buying a commercial space, as this is a current business in Benidorm. The average cost of a modest house with a small plot of land in the suburbs - 200 thousand Euros. If we consider the apartments in the city, but not in the center, the minimum price of a decent apartment will be minimum 70 thousand Euros. The average value of a good apartment of about 100 square meters – starts with 100 thousand Euros.